Welcome to the “Girl with a Knife” series, and my new blog. I know that my blog will grow and change, so I invite you to grow and change with me. “Where did Girl with a Knife come from?” you ask. Enter stage left: the Souvenir Foto School (SFS). As a chronicler of memories, I really ought to have better photography skills. I should not submit to lucky shots, but intentional shots. I decided to work on food prep photos for six weeks. I’m spending many minutes per session when I take these photos. I have some ideas that are hard for me to express with a camera. One session was spent looking at uncomfortable food — so I started all over. I found the last two days that “food with a story” works better for me. Hopefully you’ll be seeing chopped, minced, sliced, diced, julienned, and plain ol’ cut-up food, once a week for the next six weeks. And my knives. I may end up with a “Where’s Waldo?” version of knife-ry. And if you have a knife to donate to my photographic cause, because my collection is sadly lacking, give me a call. This post is part of Simple Lives Thursday, one-quarter of which is hosted by Iowa mom Diana. It’s simpler for me to learn photography skills through online challenges than through other avenues. 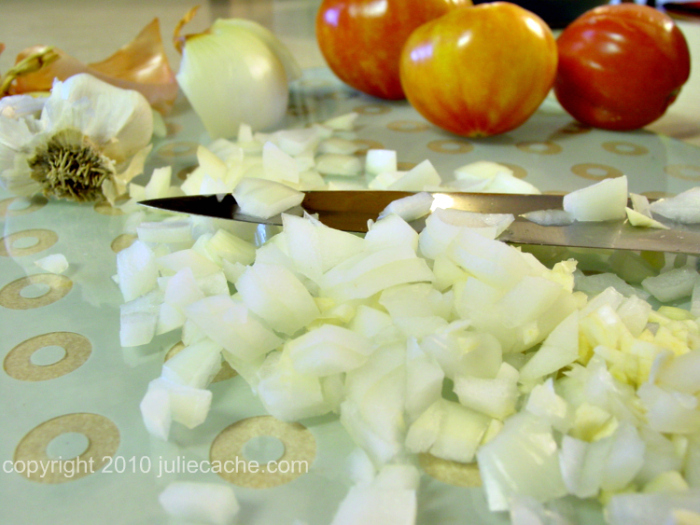 This entry was posted in blogging, photography and tagged food, girl with a knife, photo challenge, SFS. Bookmark the permalink.